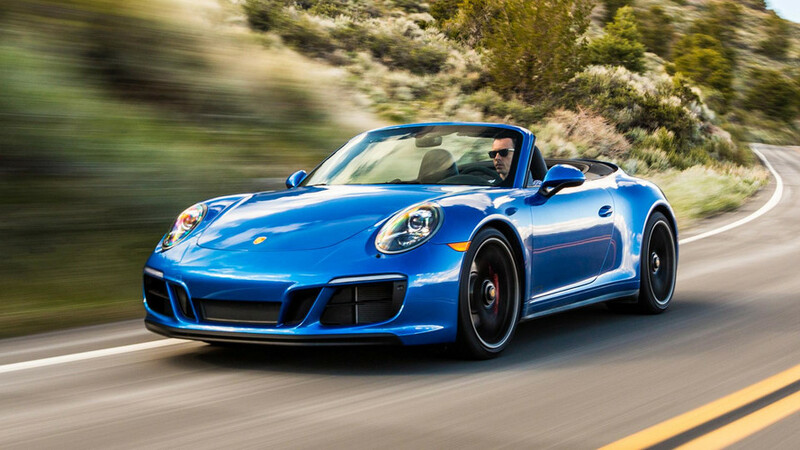 With so much fun bundled into a single car, one day of driving the GTS simply is not enough. Most car companies like to brag about how much sound deadening they put into new cars to make them quieter. Not Porsche. For the 911 Carrera GTS, engineers removed insulation from the A- and B-pillars, rear bulkhead, and rear wheel arches so that the driver can better hear the engine and exhaust. That’s my kind of sports car. 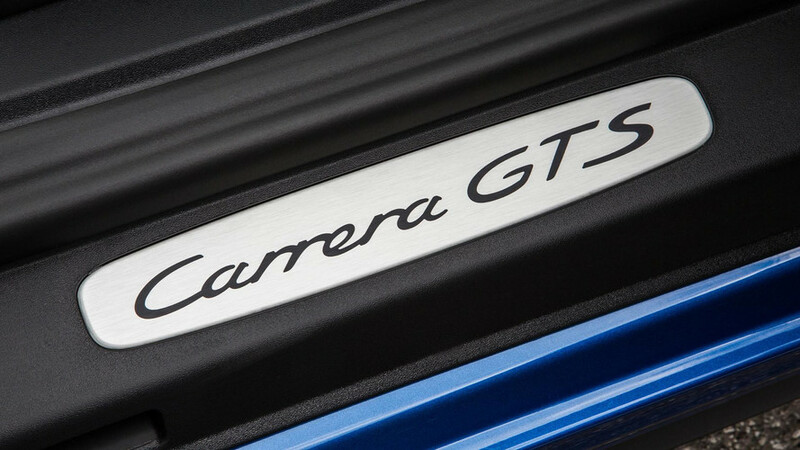 The newest 911 GTS takes the Carrera S and upgrades it with driving enthusiasts in mind. The engine, for starters, has larger turbochargers. 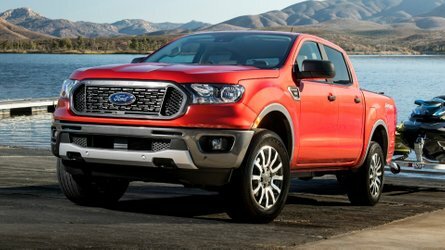 Now forcing 18 psi instead of 16 through the 3.0-liter flat-six, they raise outputs by 30 horsepower to 450, and by 37 pound-feet of torque to 405. 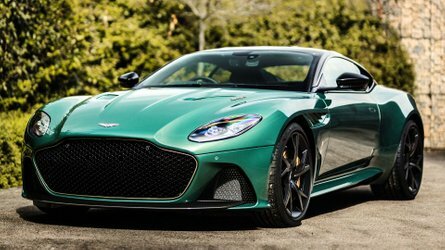 That cuts 0-to-60-mile-per-hour times by about 0.3 seconds, depending on model; the best-performing GTS variant, an all-wheel-drive coupe with the PDK dual-clutch transmission, rockets to the benchmark in just 3.4 seconds. An adjustable sports exhaust comes standard, all the better to let the engine shout. The engine snarls and roars behind me, with nice burbles and crackles from the exhaust when you downshift. 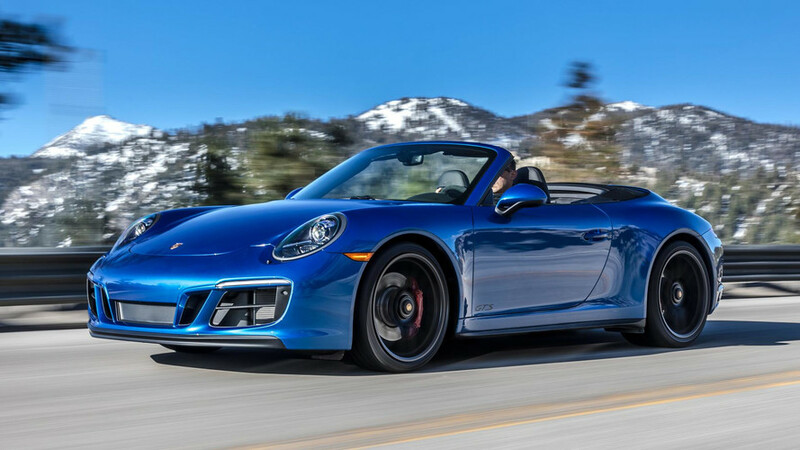 Chassis changes begin with standard Porsche Active Suspension Management, which rides 10-20 millimeters (0.4-0.8 inches) lower than equivalent non-GTS cars; a new front fascia that improves downforce; a redesigned rear wing that also improves downforce; extra rear brake cooling ducts; and the 20-inch center-lock wheels from the 911 Turbo S. In fact, the rear wheels are actually half an inch wider than on the 580-hp Turbo S. The tighter packaging of the GTS’s engine allows for the extra width. 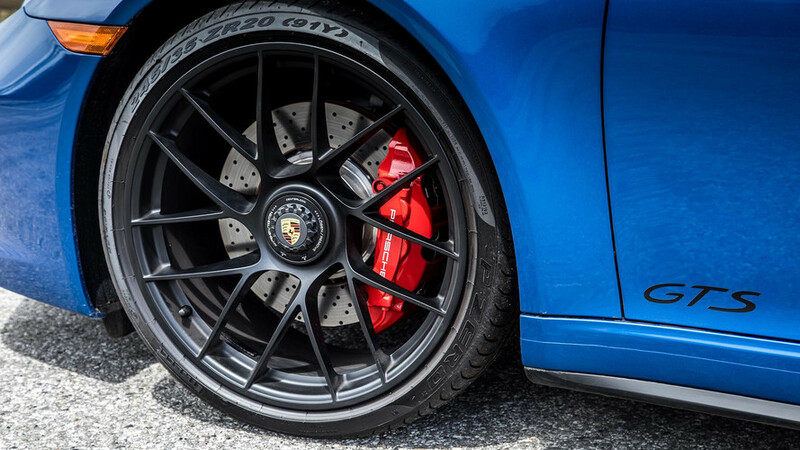 Rear-wheel-drive models also wear the wider bodywork of the all-wheel-drive Carrera 4 models, increasing the car’s width by 1.6 inches – allowing for fitting those wider wheels and tires. 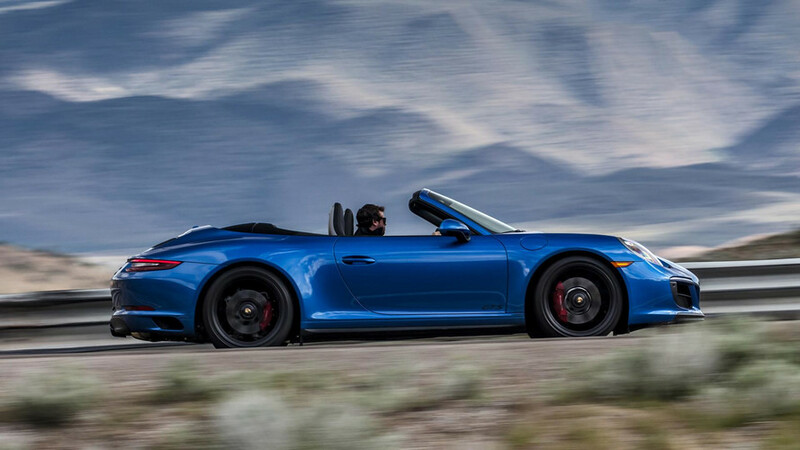 Drop the top, hit the road, and the GTS Cabriolet is seriously quick – four seconds flat to 60 mph and a claimed 192-mph top speed. Power comes on early and keeps building all the way toward the top of the tachometer, pulling hard in every gear. The engine snarls and roars behind me, with nice burbles and crackles from the exhaust when you downshift. There is no electronic augmentation of the sound, either. Everything you hear comes either from the exhausts or by way of the twin tubes that direct reverberations from the intake tract to the firewall behind the back seats. 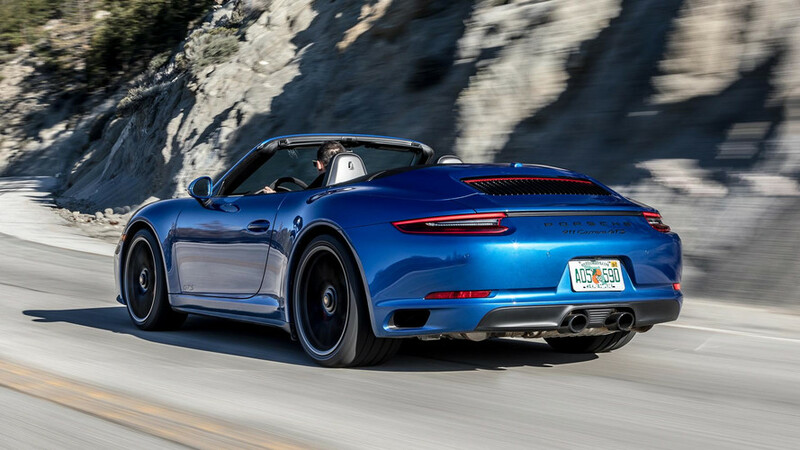 Turbocharging has provided the newest 911 range with so much more low-end shove than before. 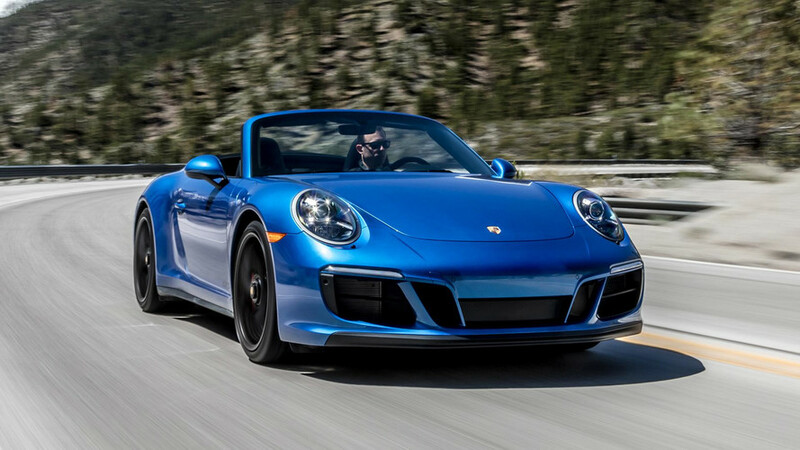 Compared to the last, naturally aspirated GTS, the new model produces an additional 80 lb-ft of peak torque, and it’s delivered from just 2,150 rpm instead of 5,750. The result: You no longer have to wring the engine out so frenetically to get maximum power. Leave the gearbox in third or fourth and there’s still plenty of pulling power to hurtle toward the next bend. As to handling, well, the GTS grips for days. 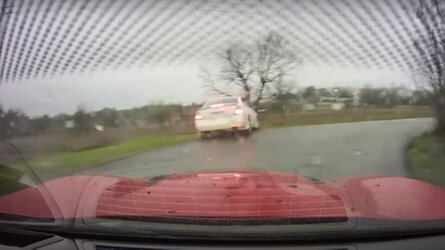 Barely a millisecond passes between me turning the wheel and the car digging into a bend. Shifting is a reward in its own right. 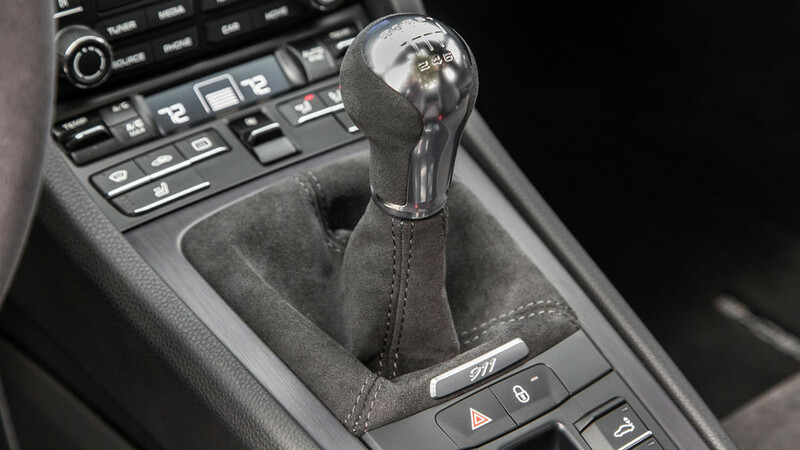 Porsche’s manual transmission has strongly defined gates, and a light but thoroughly mechanical action that’s a joy to use. 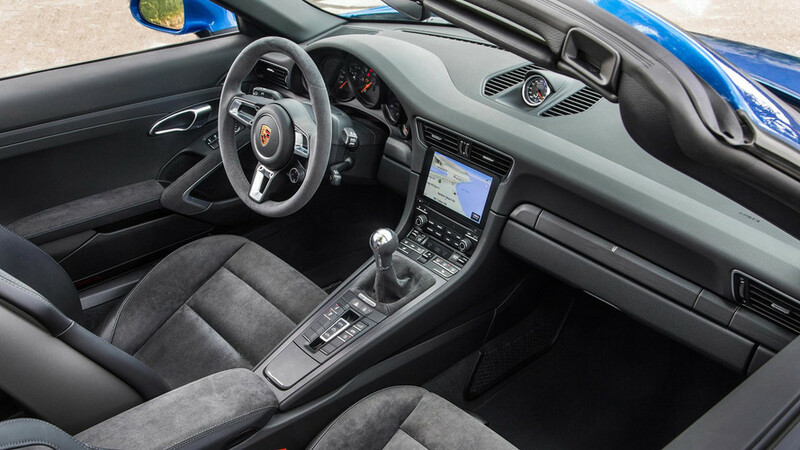 Only 37 percent of GTS buyers pick the manual, though, with the remainder electing the PDK dual-clutch transmission. As much as I love shifting for myself, I can’t fault anyone for going PDK. Left to its own devices in traffic, it’s perfectly smooth and civilized. Dialed up to Sport or Sport+, the computers always pick the right gear for swift driving. 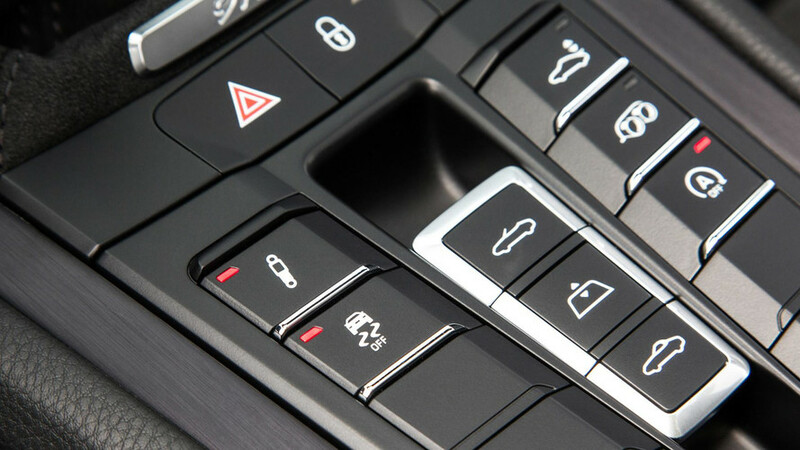 And when you knock the shifter over into the manual-shift mode, the transmission completes gear changes almost before your fingertips leave the paddles. As to handling, well, the GTS grips for days. Barely a millisecond passes between me turning the wheel and the car digging into a bend. Dial the adaptive suspension up to Sport or Sport+ and the car stays supremely flat, the Pirelli summer rubber offering more traction than I could ever exploit on the street. The electric power steering manages to filter out noise and send only the most useful feedback – road surfacing, is the front end going light, etc. It’s more like a hushed conversation between friends than a shouting match at a party. Despite that capability, the car never feels aloof. It communicates exactly what’s happening and is playful through the winding mountain roads on the California-Nevada border. Yes, it’ll devour open roads and whip through curving ones, but not without me working hard to extract the maximum speed. The GTS is very satisfying to drive briskly, and hugely thrilling when you do so. The GTS is very satisfying to drive briskly, and hugely thrilling when you do so. 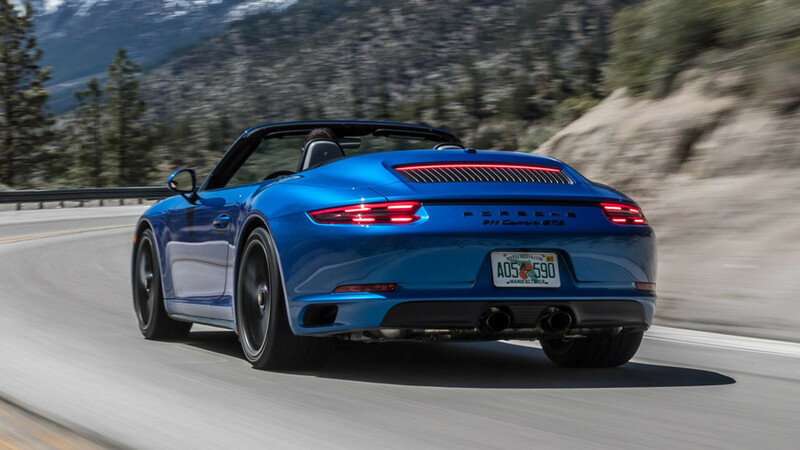 Aside from road performance, the 911 GTS is also extremely capable on a track. 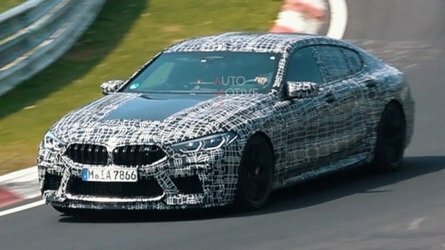 With its standard Pirelli PZero N1 tires, it lapped the Nürburgring in 7 minutes and 26 seconds, which is 12 seconds faster than the old GTS and even 4 seconds faster than today’s Carrera S. Upgrade to the optional ultra-high-performance Pirelli PZero Corsa N0 tires, and that lap time drops to 7:22 – which is only ten seconds behind what the 911 GT3 put down. 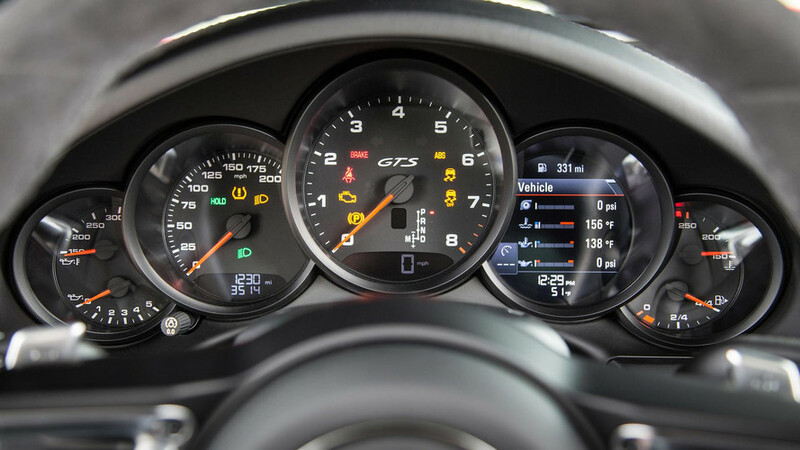 Whether lapping the ‘Ring or on public roads, the inside of the 911 GTS is a high-tech place to spend time. To the right of the giant analog tachometer is a full-color trip computer that can show data like fuel economy, the navigation map, current g-forces, and engine torque output. 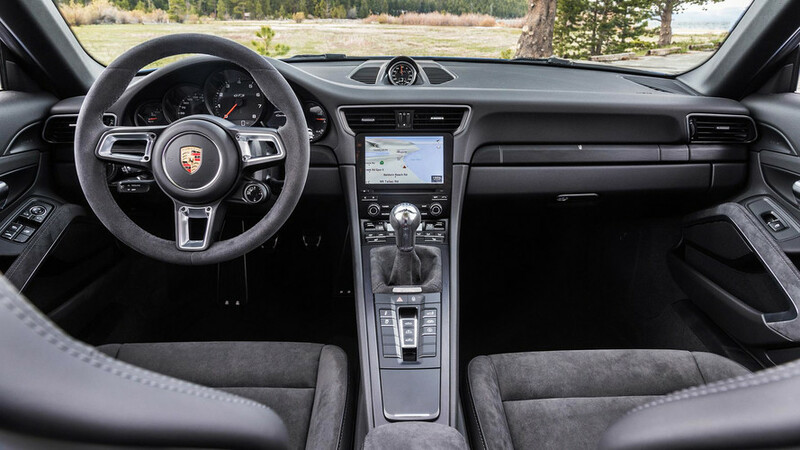 The newest version of Porsche’s touchscreen infotainment system has a seven-inch display with fresh software (including a smartphone-like tiled home screen) that makes it easier to use than ever, and there’s support for both Apple CarPlay and Android Auto. The Porsche Track Precision smartphone app links to the car to capture your lap times and performance for later review; 130 circuits worldwide are built into the software’s database. If you’ve got an Apple Watch, you can even record your pulse at various points in the drive. The options list is, in typical Porsche fashion, extremely lengthy. Notable highlights include rear-wheel steering, a front-axle lift function for getting into steep driveways, Porsche Dynamic Chassis Control active anti-roll bars, carbon-ceramic brakes with signature yellow-painted calipers, adaptive cruise control, various interior carbon fiber trim, LED headlights, and so on. 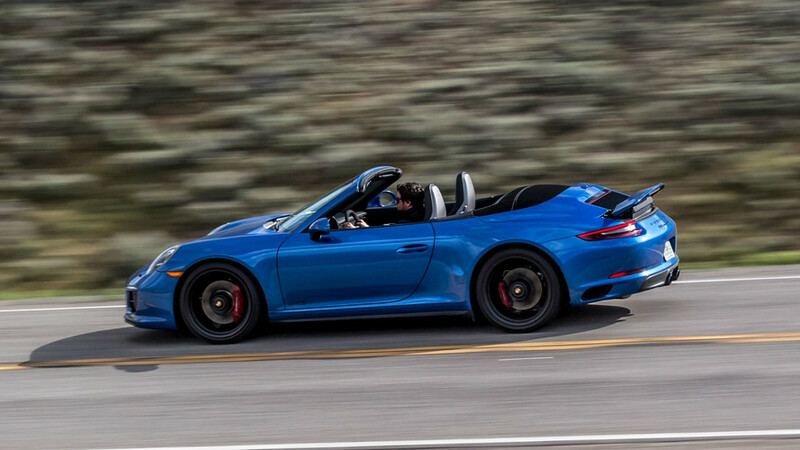 The GTS is the best 911 variant for most enthusiast buyers (or those who can’t afford a GT3, at least). Demerits? Sure. 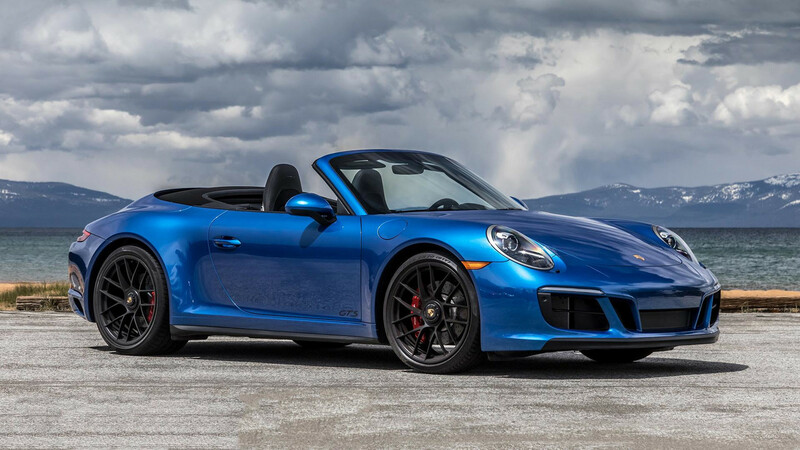 The 911 GTS is an expensive toy, starting at $120,700 (before options and destination) for the rear-drive coupe and running to $139,900 for the Targa. Clutch feel is non-existent and the lengthy, light travel feels totally at odds with the other two weighty, precise pedals. And even these six-figure test cars have plenty of blank switches in the center console, which looks cheap. 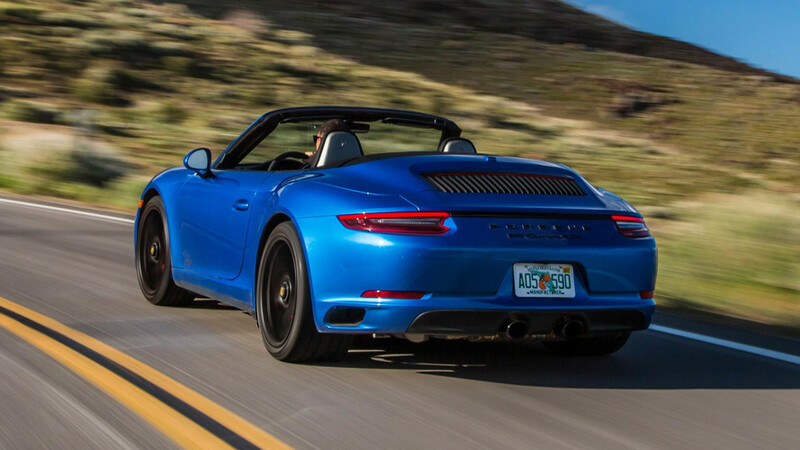 The GTS is the best 911 variant for most enthusiast buyers (or those who can’t afford a GT3, at least). 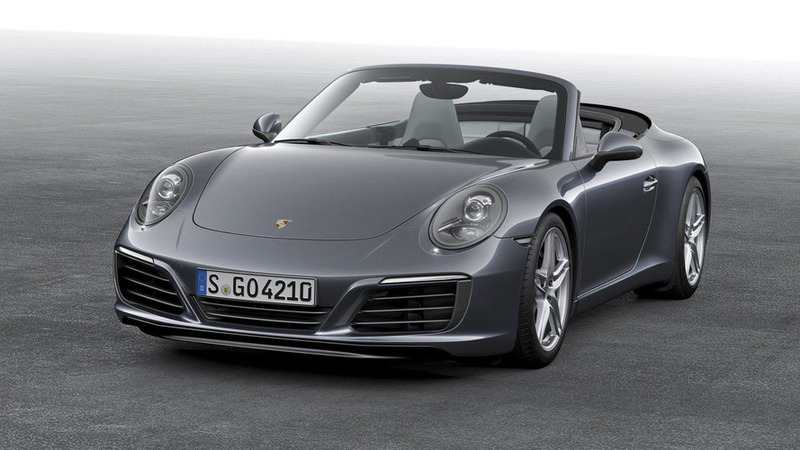 In years when it’s offered, the GTS accounts for 20-25 percent of Porsche 911 sales. 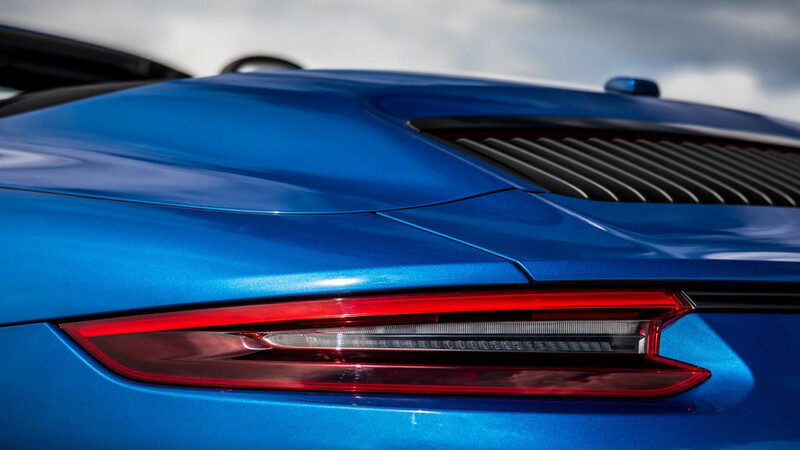 It’s easy to see why: Approachable yet capable, thrilling yet livable, it’s the distillation of all the virtues we’ve come to expect from Porsche’s iconic sports car. Most telling of all, it’s the type of sports car in which I never feel the need to turn on the radio because simply driving is entertainment enough. The tragedy, then, is that I spent but one day behind the wheel. That’s far from enough time to really get to know the GTS.